Some brides are lucky enough to have an heirloom gown in the family or to fall in love with a gown in a vintage or thrift shop. Sometimes it's a simple matter of altering the dress to fit a modern (usually larger) figure. Panels can be added, fabric from a train can be recycled to the body of a gown, often similar fabrics can be found to fill gaps. Here I show a few more extreme examples where brides have chosen to completely restyle a gown or where a gown needed extreme restoration work. Usually we find that the original wearer is thrilled to have her gown worn again, no matter how many changes are proposed by the modern wearer. 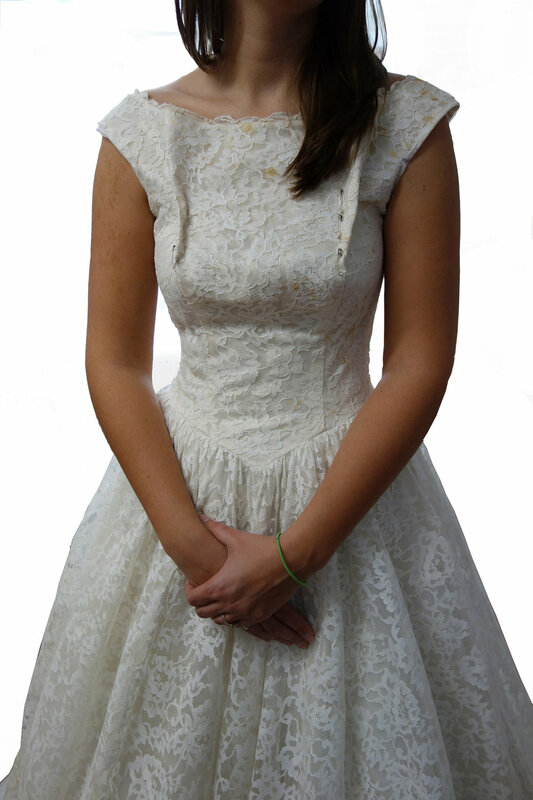 The bride's grandmother wore this dress with a full skirt, huge shoulders, elbow-length sleeves, a heavy belt, high neckline, and stiff taffeta slip. 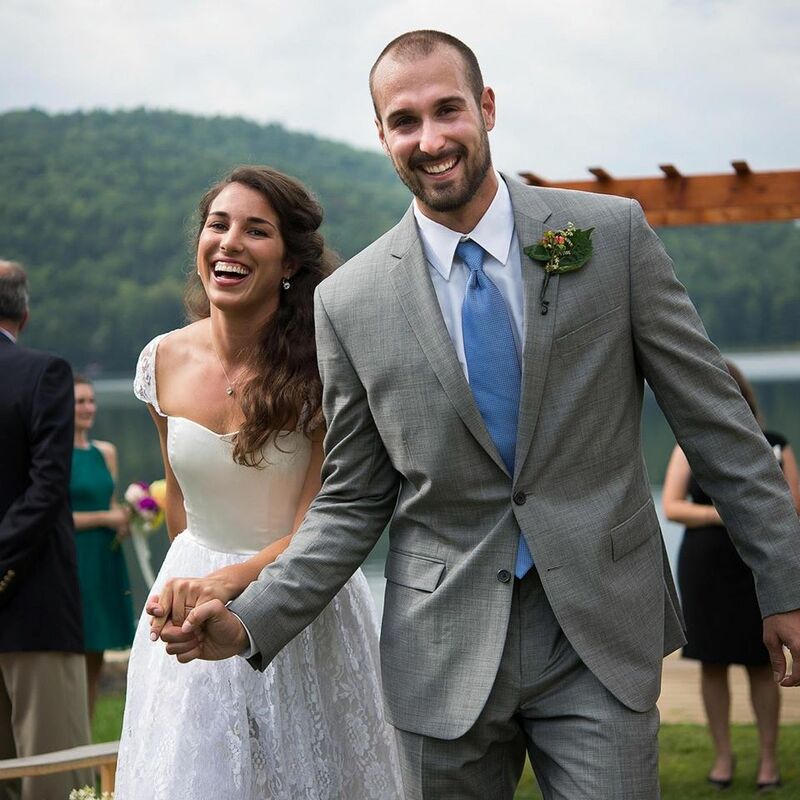 The bride chose to remove the sleeves, lower the neck, make the dress more fitted, with a softer silhouette, and replaced the armor-like belt with a soft ribbon. We replaced the stiff slip with one of bias-cut silk charmeuse, a fabric that will cling and drape. Elizabeth needed to be able to play the trombone at her reception, not something her grandmother tried. After restyling, the dress gives Elizabeth room to dance, play trombone, and enjoy her special day. Before restyling, with the slip removed, the gown is still restricts movement too much. 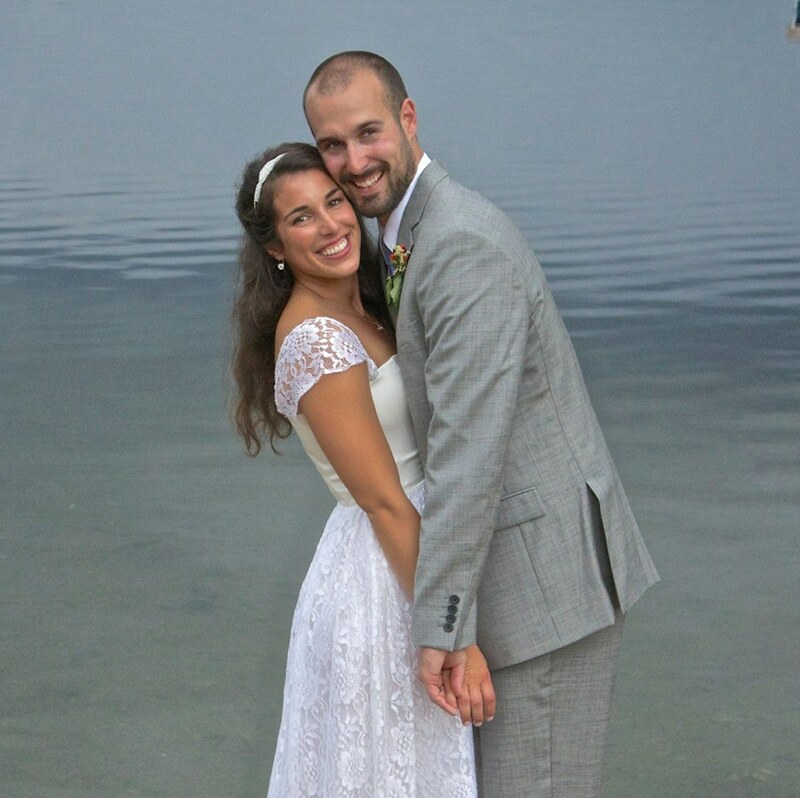 The grandmother of the groom gave her gown to Lindsay to use as fabric with no restrictions. We removed most of the fullness from the skirt, lowered the neckline, raised the waist, took off the sleeves, and re-cut the bodice to have straps. Before and after photographs show the grandmother and the bride, both in the prefect gown, one for a formal affair and the other for a garden party wedding. After restyling, with the petticoat and sleeves removed, neckline changed, and train removed - a different look for a more casual event. The back of the restyled gown, sleeveless with a low back and no train. Easy to kick up her heels. Emily bought this gown at a vintage clothing store. She decided to remove the lace overlay from the bodice and when we saw the polyester underneath she opted to replace it with a strapless silk satin corselet top. We then removed fullness from the skirt and graded the hem to be higher in front. The lace cap sleeves were added to help the satin top relate to the lace skirt. Sarah wore her grandmother's gown and wanted to keep as many elements as possible. The original lace was all small pieces appliqued onto netting which was disintegrating. We removed the long fitted sleeves, as they were beyond repair, but there was enough salvageable material to make cap sleeves. 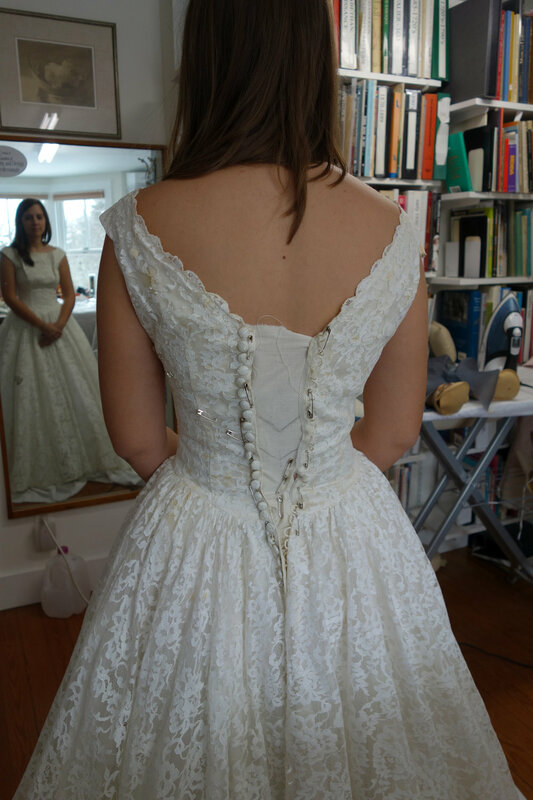 Then I sewed new silk netting behind the lace appliques, restoring the dress for Sarah. 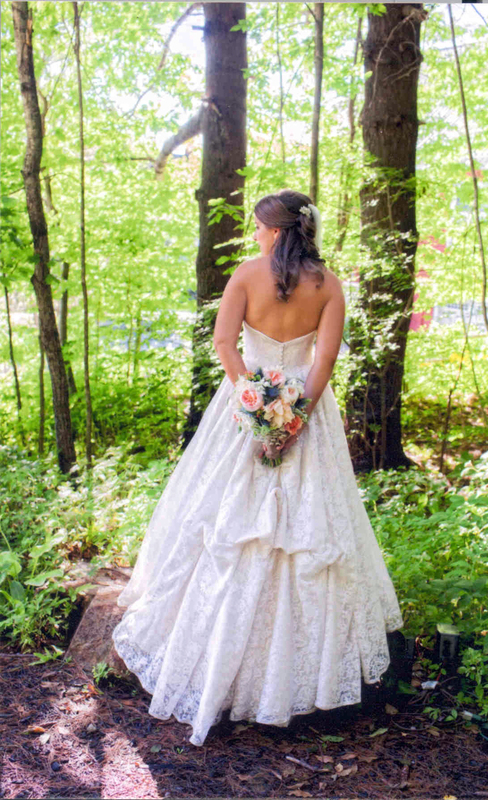 Karly loved the idea of wearing her family's gown, but has always pictured herself in a strapless wedding gown. We kept the basque waist and the full skirt, but cut the bodice down. When we made that change, the gown no longer needed a placket added! An extra bonus.